Fun fact: 2040 is closer than 1990. Woah… that brings things in perspective. If you are still living in 1990 or 1995 or 2000 I think it is time to grow and change! Team last year I had a one word goal of LISTEN. The year before was PATIENCE. This year I chose FACIL. It means easy in Spanish. As in, get going, get it done, don’t think hard, think EASY. Easy sounds too cheesy, too cliche, almost mocking any insurmountable task or mountain. FACIL, SOUNDS doable! Which all things are thru communication, hard work, team, and the power of the Spirit in you! TEAM DO NOT DELAY. DO NOT LIVE IN FEAR. EMBRACE AND LOOK FOR CHANGE. AND GET TO IT. YOU WON’T KNOW UNLESS YOU FRIGGIN GO FOR IT! AND WHEN IS THE BEST TIME? NOW! 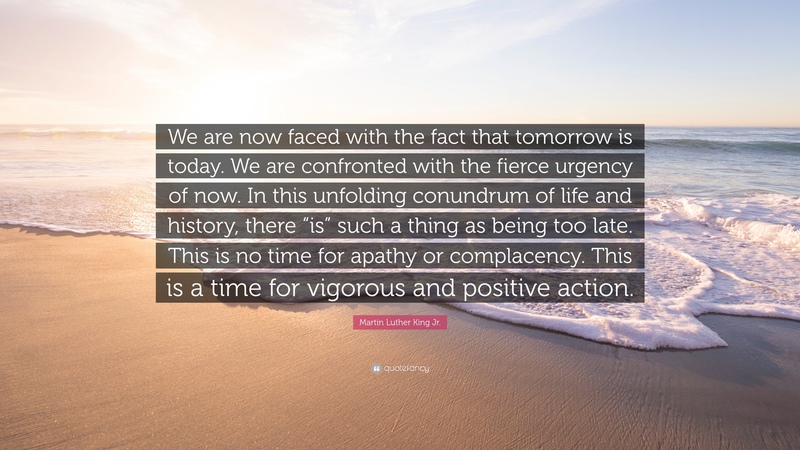 Below is Martin Luther King Jr. quote on the power of NOW.